This bread has been in the pipeline for a while ever since discovering that beer makes a rather marvelous ingredient in bread. Not only does it give it taste, it also gives it a lovely soft texture. Now I feeling more confident with the whole science of bread I’m feeling better about experimenting with it and more or less most of time the experiementation works! I was expecting the beer to give the bread a slight pinky hue, but this didn’t appear to happen, it did however brown quicker than conventional loaves due to the sugar content in the beer.For the fellow food geeks out there I think this is an example of the Maillard reaction that can also be seen in the caramalisation of the outer surface in pretzels.Ok, geekyness over. Because of the sugar in the beer there is no need for additional sugar in the dough as the dough turns out sweet enough without it. You can certainly taste the fruit beer in the bread. It is lovely simply toasted with a small amount of butter, plus it would also make a fabulous twist on bread & butter pudding. Tomorrow for breakfast we are using the last few slices to make French Toast. The recipe is based on White Tin Loaf recipe with a few tweeks. Oh an ignore the photo, I’m not happy with it. It’s a fine photo until I upload it then it goes all blurry?!? Like quite a bit of my bread baking I have submitted it to Yeastspotting. 1) Mix all the ingredients together until well combined then knead for 10 until dough is soft and springy. Form into a tight round place in a lightly oiled bowl, cover bowl in clingfilm and leave to rise until nearly doubled in size. 2) Oil then lightly dust a 2lb loaf tin with flour. Knock back the dough then form the dough into a tight fat sausage shape and place in the tin. To help the bread to rise well try to tuck the ends of the dough under when you put it into the tin. This encourages the dough to go up rather than out. Leave to prove for around 30 min or until dough has begun to risen near the top of the tin. 3) Preaheat oven as hot as it will go. Place a baking tray of boiling water at the bottom of the oven (this helps a good crust to form on the bread). Slash the top of the dough then bake for 10 min. See how the crust is browning then turn down to 200C if the crust is pale/180C if crust is noticeably browning/170C if crust is browning quickly and cook for a 40-50 minutes. The bread is ready when the bottom sounds hollow when it is tapped. Cool on a wire rack before slicing. This looks great, and you also get one of your five-a-day! Your photographs are really stunning, so clear. Yum – will give this a go soon, when the marking has died down a bit and I have a couple of hours spare. Sounds divine and picture looks great. You’ve inspired me to bake. May try your recipe with a Lambic style beer, yum. Certainly give it a go. The beer gives the bread a delicious taste. 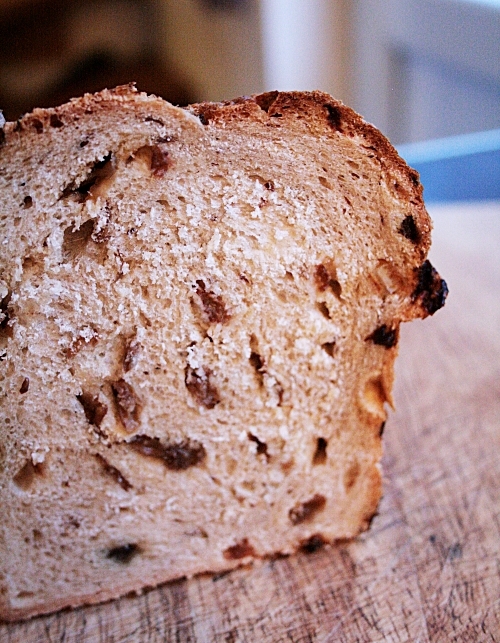 I’ve made beer bread once, and it was so easy and hubby loved it. We’ll have to try this one as well. I do believe a slice of this bread toasted, with butter melting into it, would be just the thing to help me along with my Sunday morning recovery process!! Lovely looking fruit bread Jules. Photo looks good to me too! I have sweet almond oil that I purchased from a health food store in the bath section. I’ve made my own lotions and balms with the oil…but would this be the same oil I can bake with? It is real almond oil without additives…it just seems, i don’t know…not quite right to use. I buy my sweet almond oil from the specialist oil section in the supermarket. I have been known to use it as a beauty product. I wouldn’t be sure if the oil you have is food safe. I have heard such good things about putting beer in bread but still haven’t done it! This looks so fantastic you are making me realize why I need to get to it. Joanne, it’s worth it as it really transforms the texture of the bread.